When Ospreys are ringed they are usually fitted with two rings, a metal BTO ring which has a unique number and an address so that finders can send finding details to the BTO as part of the national bird ringing scheme, and a plastic ring known as a Darvic ring which can be viewed from a distance with binoculars or a scope. Darvic rings are usually referred to by their two colours, eg Blue/White, where Blue is the colour of the ring and White the colour of the lettering. 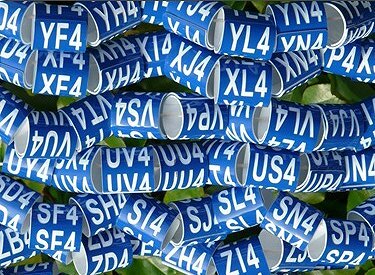 Most rings have two characters (figures or letters) but from 2012 birds ringed in Scotland will generally have three. Early rings only had one character. You will also sometimes hear rings referred to just by the ring colour eg 'Red 8T' which is really 'Red/White 8T'. Rings should be fitted so that they read from the foot up although you will sometimes find one fitted the wrong way round. In recent years, colour rings in Scotland have been placed on the left leg and those in England and Wales on the right leg. Most of Europe has now adopted a particular colour ring for ospreys. UK is Blue, Germany is Black, France is Orange and Spain is Yellow. Roy Dennis, to whom all sightings of colour ringed ospreys should be reported, is always interested in hearing about them, preferably with a photo.